Aufgrund dessen das einige Auflagen diverser Alben vergriffen sind, haben wir uns dazu entschieden fast alle Alben sowie EPs neu zu gestalten. Es werden alle Cover sowie CDs ein neues Artwork bekommen - die Alben werden entweder als Digipacks oder als Cardboard Cover erscheinen. Mehr Infos in Kürze. Due the fact that some editions of various albums are sold out we have decided to reshape almost all albums and EPs. All covers and CDs will get a new artwork. The albums will be released either as Digipacks or as Cardboard covers. More information soon. Schöner Artikel im UNTER-TON Magazin. Nice article in UNTER-TON Magazin. Wir wünschen allen ein gutes 2019. 2019 wird es ein neues SW Album geben, es sind schon einige neue Stücke aufgenommen. Desweitern wird in den nächsten Wochen eine limtierte Auflage auf CD von einen Livemitschnitt eines Konzertes aus dem Jahr 1999 veröffentlicht. "Live in Strasbourg 1999 - The Bootleg Recordings". We wish you all a great 2019. In 2019 there will be a new SW album. Several tracks have already been recorded. Besides that a limited CD with live recordings from a concert in 1999 will be released soon. "Live in Strasbourg 1999 - The Bootleg Recordings". Heute erschienen im THRESHOLDMAGAZIN: Ein Artikel über 32 Jahre SW. Here is a new article about 32 years of SW in the THRESHOLDMAGAZIN. Morgen am 29.08.18 gibt es um 22.00 ein einstündiges Radiospezial von SW auf Radio Dreyeckland. Es werden Lieder von damals bis heute präsentiert. 1 hour radio show about SW on Radio Dreyeckland. They will play songs from then untill now. SWEET WILLIAM on the radio again. This time "Four Days" from the album "Early Days 1986 - 1988"
the album "Kind of strangest dream - 2012". Die CD Box "5 CD Box Rarities 1986 - 2016" ist leider ausverkauft ! Ende des Jahres eine erneute limtierte Box mit anderem Inhalt. The CD Box "5 CD Box Rarities 1986 - 2016" is sold out ! CD Box by the end of the year with different content. und Angebote für viele CDs und Merchandise. We got some new prices in our shop. Lots of special offers for many albums and merch stuff. Feel free to visit the SW shop. The new album "The Early Days" is available now. Comes in digipack. Das Jahr 2018 beginnt mit einer neuen Veröffentlichung auf D-Monic Records. Das Album "The Early Days 1986 - 1988" wird in den nächsten Tagen erscheinen. zuvor in einem Studio aufgenommen wurden. 2018 will start with a new release on D-Monic Records. The album "The Early Days 1986 - 1988" will soon be out. It contains tracks from the very beginning of SW - written in 1986 - 1988. All the tracks were never recorded in a studio before. Rarities 6 ab sofort hier im Shop erhältlich. Rarities 6 now available only here in our shop. In der November Ausgabe des Sonic Seducer Magazins ist ein SW Interview erschienen. Auf der Beilage Compilation CD des Magazins sind SW mit dem Stück "My Ignorance" vertreten. with the track "My Ignorance". SW on CD Compilation "The Seeds Of D-monic Vol. 1"
D - Monic hat eine Compilation veröffentlicht. Alle Stücke stehen zum kostenlosen Download zur Verfügung. SW sind mit dem Stück "Insane" auf dem Sampler vertreten. D - Monic has released a compilation. You can download all tracks for free. or pay whatever you like to support the label. SW is part of the compilation with the track "Insane". can therefore only be "TIME"
WEDNESDAY 30.11.2016. It will be released on d-monic Records, France. 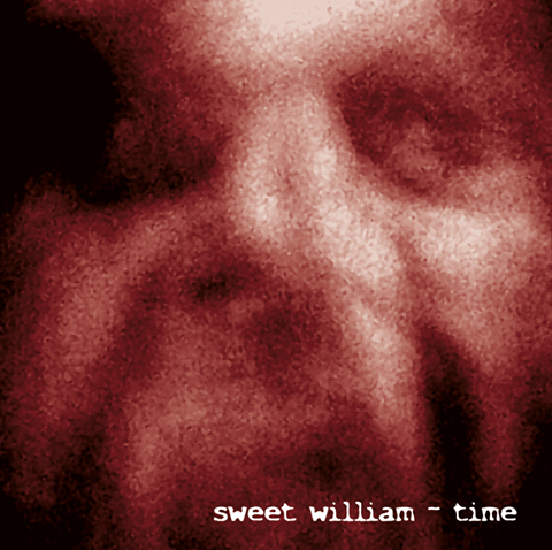 We are very happy to announce that the new album entitled "Time"by the German cult act Sweet William has just arrived at our office. As a consequence you can immediatly order it ! 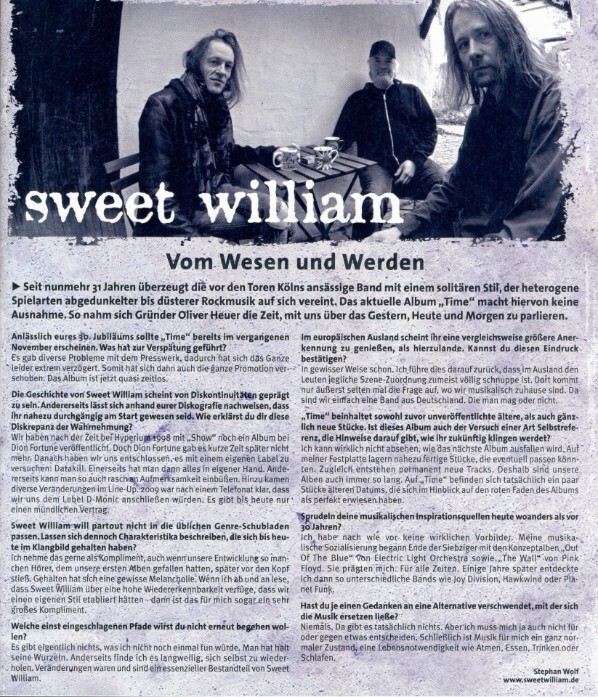 Song: "Kind" acoustic Version from the album "Organic Shades"
SW news on "Music & Elswhere"
SWEET WILLIAM (Germany) - It seems we're not the only band who have celebrated their 30th anniversary in October, so have Oliver Heuer's SW. Admittedly, our own celebrations may have gone a little skewiff, but I'm pleased to say they didn't join us in spending three months trapped in another dimension. 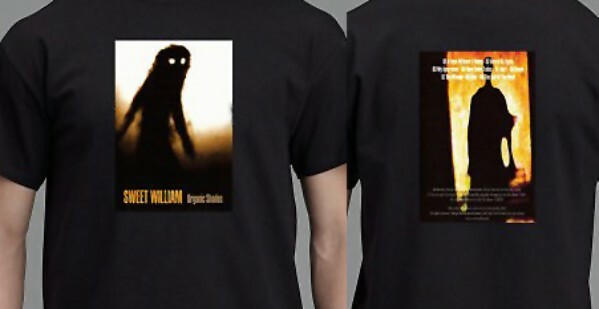 Instead, they went for the more sensible options of a book, a CD boxed set and a special commemorative t-shirt. I think we'll let them plan ours next time, not that I didn't enjoy a half a lager and a bag of crisps in The Bourne Arms, it just seemed a little understated for three decades. You live and learn. Full details on the SW website, enjoy muchly. 5 CD Box with all "Rarities" Albums - plus Bonus CD EP "Shine" from 2005. Total running time over 6 hours ! Handmade limited 99 copies ! Nächste Veröffentlichung !! Nach etwas längerer Zeit gibt es wieder ein Rarities Album. "Rarities 5" hat eine Spielzeit von über 70 Minuten und enthält 11 unveröffentlichte Studio Outtakes. Next Release !! 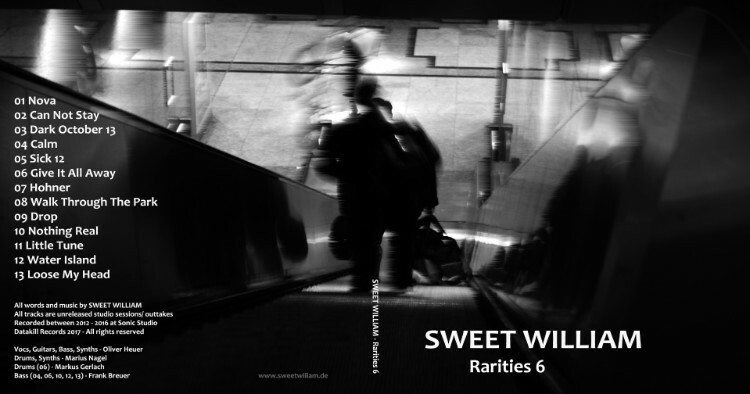 After a long time SW release another Rarities album. "Rarities 5" is over 70 minutes long, 11 unreleased studio outtakes. Das nächste neue Album 2016 "ORGANIC SHADES" ist ab sofort nur hier im Online Shop erhältlich. Auf dem Album befinden sich akustische Versionen diverser SW Stücke. The next new album 2016 "ORGANIC SHADES" is available only in the online shop right now. The album contains acoustic versions of SW songs. Also available in the online shop is the T Shirt "Organic Shades". Black shirt, printed front and back. Im Oktober werden SW 30 Jahre alt. Es wird im Laufe des Jahres einige Spezials geben. von damals bis zum Anfang 2016. 44 Seiten DIN A5 in Farbe. Sprache Englisch. In October SW will be 30 years old. Therefore there will be some specials this year. anecdotes from then until early 2016. 44 pages DIN A5 full coloured, in English. Church Rock Night - Ev. Kirche Kerpen Sindorf - 8 o'clock p.m.
Our label D-monic records is celebrating their 10th anniversary !! Congrats !! Unser Label D-monic Records feiert sein 10jähriges Bestehen !! Alles Beste !! Aus diesem Grund bieten wir Euch eine kostenlose SW Download Single an. Next concert will be on the 19.12.15 at Musikschule Lämmle Kerpen Sindorf. Das nächste Konzert findet am 19.12.15 in Kerpen Sindorf in der Musikschule Lämmle statt. diesjährigen "7 Tage NIX" Festival. SW will play on this years "7 Tage NIX" Festival, Alte Feuerwache Cologne, on the final evening on 01.11.15. 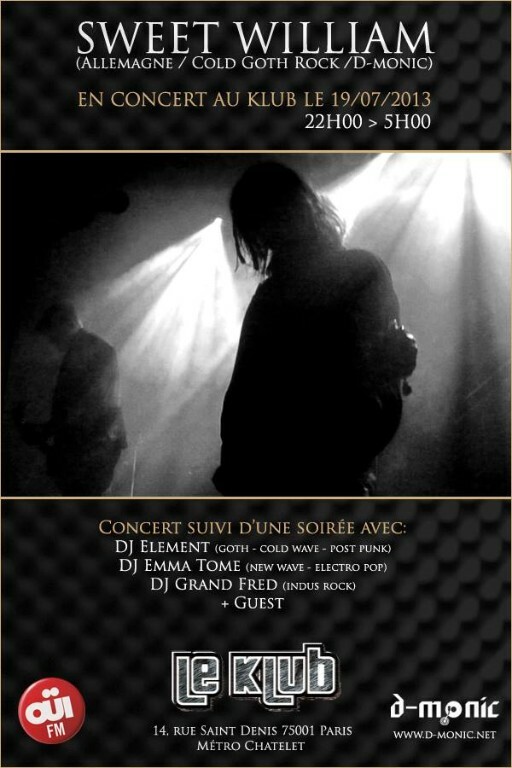 The SW Live album "Live on the French Riviera 1995" is out now. It is strictly limited - 100 CDs - you have to be fast to get your copy! im Shop zu erwerben. Wir haben nur einige wenige CDs in unserem Shop. 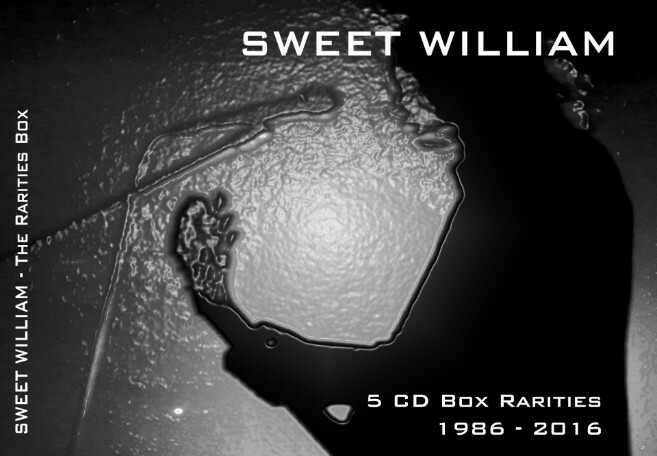 We are working on our next release, it will be an exclusive and very limited (100 handnumbered copies) vintage live CD album of SWEET WILLIAM recorded in Cannes (France) in 1995 !!! Eine der nettesten und wichtigsten Personen der "Untergrund Musikszene" - Mick Magic ist wieder aktiv. 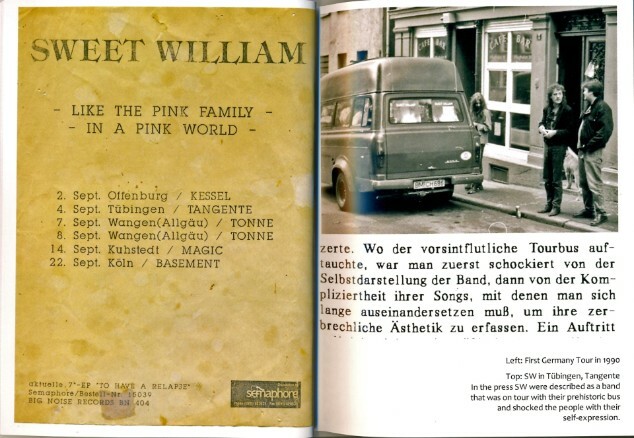 Es ist schon einige Jahre her, als Tapes, selbstkopierte Fanzines und Mailorder wichtige Kommunikationwege innerhalb der Independent Szene waren. Mick veröffentlichte einige SW und Psychedelic Danceflloor Album als Tape auf seinem "Music & Elsewhere" Label. Hier ist der Link zu seiner neuen aktuellen Webseite und seiner neusten Veröffentlichung - inklusive SW und PSYDA Stücken. Now available: OCEAN - the unreleased tracks and studio outtakes. The album contains songs that were recorded during the recording sessions for the new album OCEAN. All songs are unreleased and only available in our shop ! Jetzt erhältlich: OCEAN - the unreleased tracks and studio outtakes. Das Album enthält Stücke die während der Aufnahme Sessions zu OCEAN entstanden sind. Alle Lieder sind unveröffentlicht und nur hier im Shop erhältlich ! OCEAN is OUT NOW !! OCEAN ist ab sofort hier im Shop erhältlich. The new Album OCEAN will be out in May 2013. It will be 74 minutes long !! The first 50 orders can choose one CD from the shop for free. price and more infos soon ! Das neue Album OCEAN wird im Mai 2013 erscheinen. Spielzeit 74 Minuten ! dem Shop auswählen. preis und weitere Infos bald ! Sweet William "Ocean" album at the pressing plant, pre-order open! 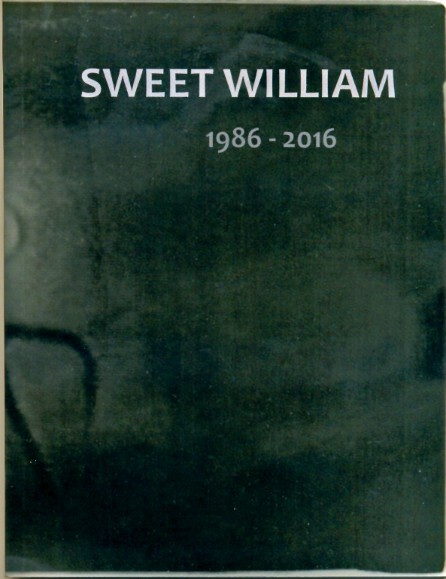 SWEET WILLIAM's forthcoming album is at the pressing plant, official release date is set for March the 30th ! The album begins with a prologue, classically instrumented, then proceeds directly with the title track "Ocean"
which finally opens the album in the good old rock style and straightforward. through the issue of "Ocean" in its content. Hyperium and Dion Fortune labels, and the first drummer of the band, Marius Nagel is back with SWEET WILLIAM ! “Ocean” is about the human abyss, weaknesses, loneliness and longing, but also about beauty, hopes, dreams and trust in life. just like the sea - the Ocean. Seit Montag, den 10.09.12 ist die Neuauflage von KIND OF STRANGEST DREAM erhältlich. Limtiert auf 444 Kopien ! Das Album ist in einem schwarzen Klappcover inkl. kleinem Poster erschienen. Das Cover erinnert stark an das Orginalcover und ist sehr edel und rundum gelungen. Erhältlich ist die CD auf Infrastition, diversen Internetplattformen und HIER. Preis und Infos gibt es im Shop. Since Monday, 10.09.12 the new release of KIND OF STRANGEST DREAM is out. Limited edition - only 444 copies ! The album comes in a black gatefold cover, it looks very noble and is really nice. common internet websides and HERE. For details and price please go to the shop. Auch wird es auf INFRASTITION eine Neuauflage von "THESE MONOLOGUES" inkl. Bonusmaterial geben. Beide CDs werden im Herbst erscheinen und auf den üblichen Plattformen sowie hier erhältlich sein. incl. bonusmaterial out on the french label INFRASTITION. Also there will be a remastered rerelease of "THESE MONOLOGUES" incl. bonustracks out on INFRASTITION. "DARKNESS BEFORE DAWN Vol 3" compilation. Jahren 2003 - 2009. Gesammtspielzeit über 70 Minuten. 2003 - 2009. Complete running time over 70 minutes. SW feiern 25 Jahre Bandgeschichte - es wird in den nächsten Monaten einige Veröffentlichungen geben. Zum einen wird es eine neue Rarities CD geben, wieder mit reichlich unveröffentlichten Material. In der 2. Hälfte des Jahres erscheint ein neues Album, erneut auf d-monic records. SW celebrate 25 years of band history - there will be several publications in the next month. First there will be a new Rarities CD, again with plenty of unreleased material. In the 2nd half of this year a new album will be released again on d-monic records. NEW CD ALBUM OUT NOW !!! Die neue CD "Brighter Than The Sun" ist ab sofort hier erhältlich. Ab Mai wird die CD auch in ausgewählten Läden erhältlich sein. The new CD "Brighter Than The Sun" is now available in our shop. The new album by SWEET WILLIAM is packed with 68 minutes of music. 14 tracks of dark electronic rock music combined with the typical SW psychedelic elements take you on a journey through the depths of human emotional conditions. The music changes from track to track – telling stories of lost souls, of hope and than the songs let the world shine again by creating warm and shimmering atmospheres. Electronic elements, loops combined with real drums, guitars, the driving bass lines, strings, pianos and the characteristic vocals are formed to a musical experience that is hard to find these days. You’ll find slow, smooth tracks going over into fast electronic songs, tracks being longer than 6 minutes as well as pop art songs of about 3:30 minutes. The new SWEET WILLIAM album “Brighter than the sun” shows the many faces of the band, the ability to surprise the listener with new elements while never leaving their typical sound that they’ve created during their long existence. perfom on a festival at Area 51 in Hilden/NRW. Nach diversen Verhandlungen steht jetzt fest. Das neue Album erscheint auf den französischen Label D-MONIC. The new album will be released on the french label D-MONIC. Das Album "Best Of - 1986 - 2006"
The album "Best Of - 1986 - 2006"
All songs have been remastered.